A competition between some of Brighton’s most creative chefs, Moshi Moshi‘s annual vegan challenge showcases both personal talent and just how excellent vegan food can be. 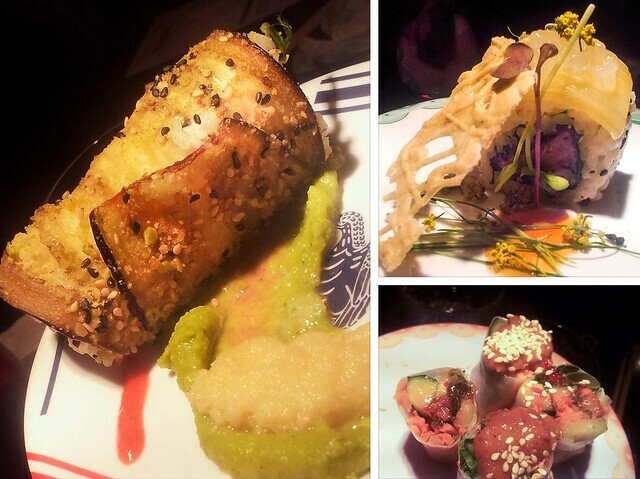 For one night the restaurant goes entirely vegan and local chefs prepare Japanese inspired dishes for diners to rank for an overall winner at the end of the night. The event is in its third year, initially inspired by the idea of what we’d eat should overfishing continue to deplete our oceans. While the obvious answer to this issue is to eschew fish completely, I appreciate the positive response to the issue from an otherwise omni restaurant. I’d like to add that Moshi Moshi is, hands down, one of my favourite restaurants in Brighton. Their vegan options are clearly marked on the menu and the staff are lovely and happy to answer any questions you might have. These two dishes were prepared by Moshi Moshi staff, with the beetroot maki placing third in the overall competition. I’m not normally a beetroot fan, but here it wasn’t at all overwhelming and absolutely ranked in my own top three. Ingredients included cooked beetroot, oshinko pickle, kampyo, red chilli, coriander, and shiitake mushrooms with spicy sour chilli sauce. The flower maki, named by my partner as trivial pursuit sushi (I’m wondering if there’s something in sushi logos? ), was good but not an overall favourite. The spicy chili coulis, however, was top notch. There wasn’t a whole lot of spice in the night to meet my taste, but this totally kicked it up a little closer to my level. The sushi ingredients included oshinko pickle, pepper, carrots, kampyo, red onion, and mizuna. 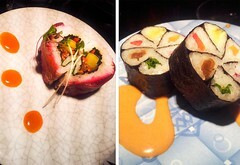 These two rolls also ranked high, with the Indian inspired sushi also in my top three for the night. Filled with cashew and pistachio nuts in an unusual but suitable pilau rice roll with Indian spices, this was my partner’s favourite savoury dish of the whole event. His only complaint was an inconsistency with the spiciness between the bites (some pieces were mild with hardly any chilli while others were a bit spicier). The shiitake mushroom maki also went down well, but I’m an avid hater of cucumber that isn’t pickled to bits so the salad was a bit much for me. The green tea dressing on the side, however, was divine, as was the hijiki seaweed rice cracker served on top of the sushi. 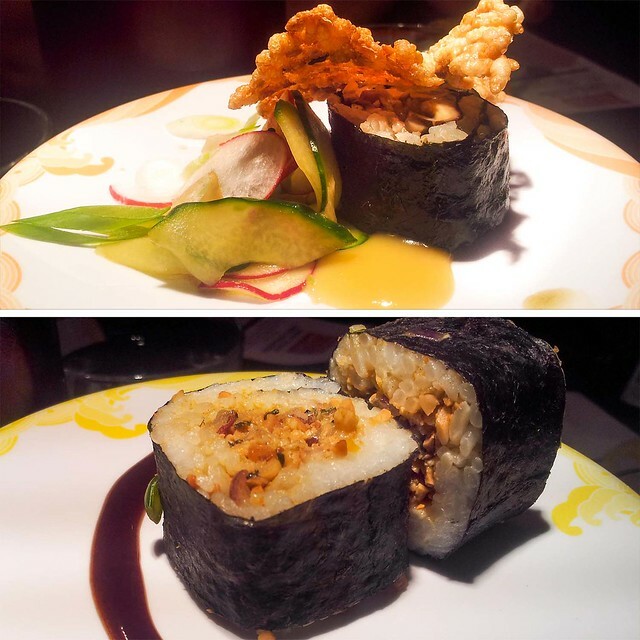 Left: Tempeh aubergine maki. Top right: Chestnut tarragon roll. Bottom right: Tofu sabai wrap. I go through phases of piling horseradish on virtually everything I eat, and wasabi is right up there with that flavour profile, so the aubergine maki, which scored second on the overall diner score of the night, was always going to be good. Also it included tempeh, one of my all time favourite foods (shadowed only by MSG and candy floss). My main complaint with this dish was the size – it was a little bulky to eat with chopsticks. Furthermore the raspberry and ume plum sauce on the side was overpowered by the other strong flavours, so may not have been completely necessary. Still, good stuff. I’d eat it again. The chestnut tarragon rolls and Thai style wraps were my least favourite dishes of the night, but admittedly my complaint about the wraps stems solely from the fact that I dislike cucumber so much (but the mint and coriander with the tofu was great). They were pretty much summer rolls with peanut sauce and sweet chilli sauce. The chestnut rolls, absolutely gorgeous in presentation, included too many strong flavours at once (which, in my opinion, greyed each other out in a way). I’d love to see this one broken down into three different makis: one where the white wine caviar topping would be stand out flavour, one where the fennel would rule, and one with the chestnut and teriyaki sauce. While I loved the idea behind the banana and peanut butter dumplings, I’m so spoiled by bananas from my travels to Southeast Asia that I’m not a massive fan of the imported varieties found here. That said, I really liked the dish overall, and I totally did plum wine shots of everyone’s leftovers. Also licked the plate. Yeah. For the £30 (£25 for Moshi Moshi members), this was a great deal and a killer night. The restaurant was heaving and I can only imagine the chefs had their work more than cut out for them, but they still managed to provide insane amounts of food. 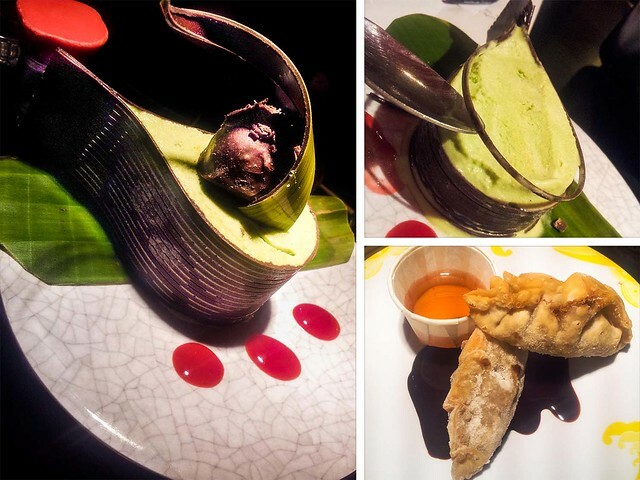 Alongside all of the above reviewed dishes they also sent out fried gyoza, edamame, aubergine dengaku, and other various vegan sushi plates. I’m already excited about next year’s competition! why did we not know about this??! : ( Looks so good, you must have had a great time!!!! Everything looks awesome, I love MoshiMoshi. Aaaaargh it was SO good! I just finished writing my review & I’m so hungry. I wonder if VBites would knock me up another one of those ice cream desserts if I gave them a quick call? !